There are many paths to and of Waking Up to this life (recovery). Some are short term interventions, some are lifetime commitments. 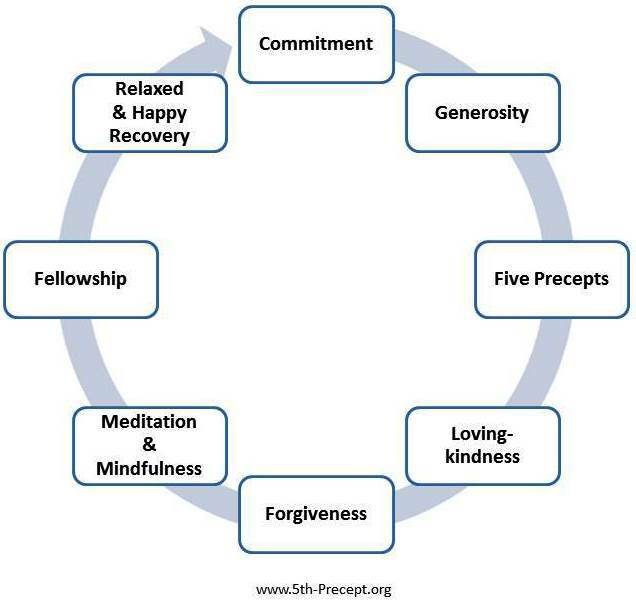 Here, is an approach to Buddhist recovery that is based on the following multidimensional/multidirectional practices. Truth, Truthfulness and Commitment (Sajja or Sacca) : pain is inevitable – suffering is optional. The truth of the way things really are; and our commitment to change. Generosity (Dana) : the antidote to the selfishness of the ‘addict self’. A generosity of heart and mind expressed in our thoughts, in our words and in our actions. Generosity gives rise to ethical living, to kindness, to the ability to forgive and to fellowship; and it supports our meditation and mindfulness practice. 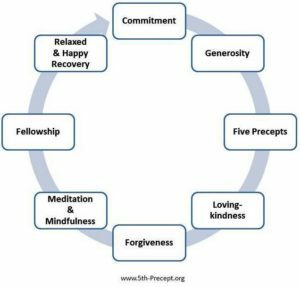 Harmlessness (Sila) : the aspiration to live fearlessly, harmlessly and skilfully in harmony with the Five Universal Precepts; using these great gifts to prevent relapse and to reduce the harm in our own life and within our communities. Loving-kindness (Metta) : the regular practice of loving-kindness meditation to lift my self-esteem and promote my well-being, and the well-being of all those around me. Forgiveness (Khama) : the regular practice of forgiveness meditation to skillfully examine and let go of the past; healing my present and embracing my future – whatever it holds. 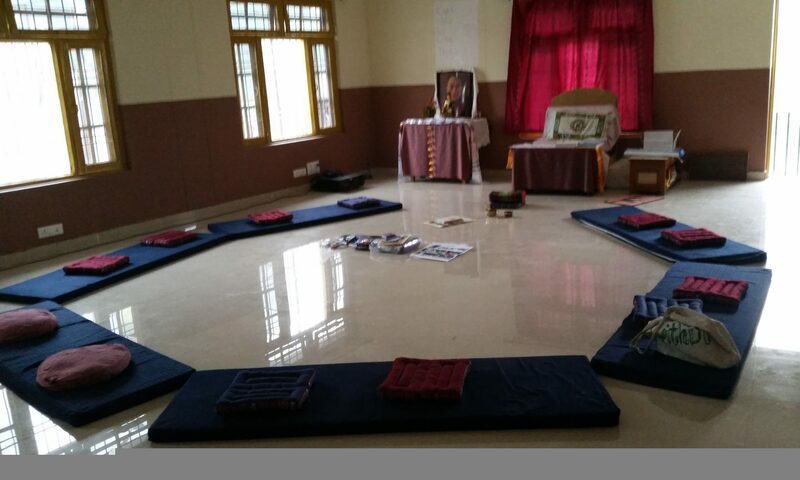 Meditation (Bhāvanā) and Mindfulness (Sati) : the regular practice of mindfulness meditation of body, mind and feelings to support my recovery. Admirable Friends & Spiritual Fellowship (Kalyāna-mittatā) : join a support group or start your own. Admirable friendship, admirable companionship, admirable camaraderie is actually the whole of the spiritual life. Sajja, the first foundation of this plan, is the starting point of my recovery and it can also be the end point of this approach. However, it is my experience that the more layers of practice that you include in your life, the more assured you can be of a relaxed, comfortable and happy recovery. It is important to note that you do not have to be a Buddhist to practice Sajja, Sila or any of these meditation practices. There is life after drugs and alcohol and it is a very good life.